NVIDIA drew consumer ire for differentiating its GeForce GTX 1060 into two variants based on memory, the GTX 1060 3 GB and GTX 1060 6 GB, with the two also featuring different GPU core-configurations. The company plans to double-down - or should we say, triple-down - on its sub-branding shenanigans with the upcoming GeForce RTX 2060. 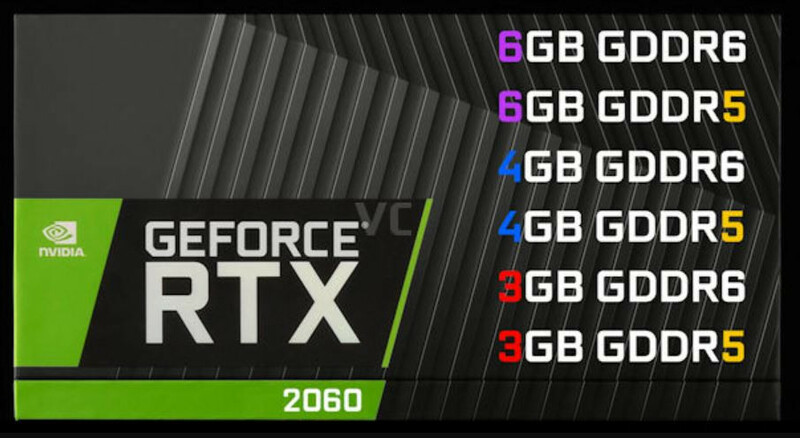 According to VideoCardz, citing a GIGABYTE leak about regulatory filings, NVIDIA could be carving out not two, but six variants of the RTX 2060! There are at least two parameters that differentiate the six (that we know of anyway): memory size and memory type. There are three memory sizes, 3 GB, 4 GB, and 6 GB. Each of the three memory sizes come in two memory types, the latest GDDR6 and the older GDDR5. Based on the six RTX 2060 variants, GIGABYTE could launch up to thirty nine SKUs. 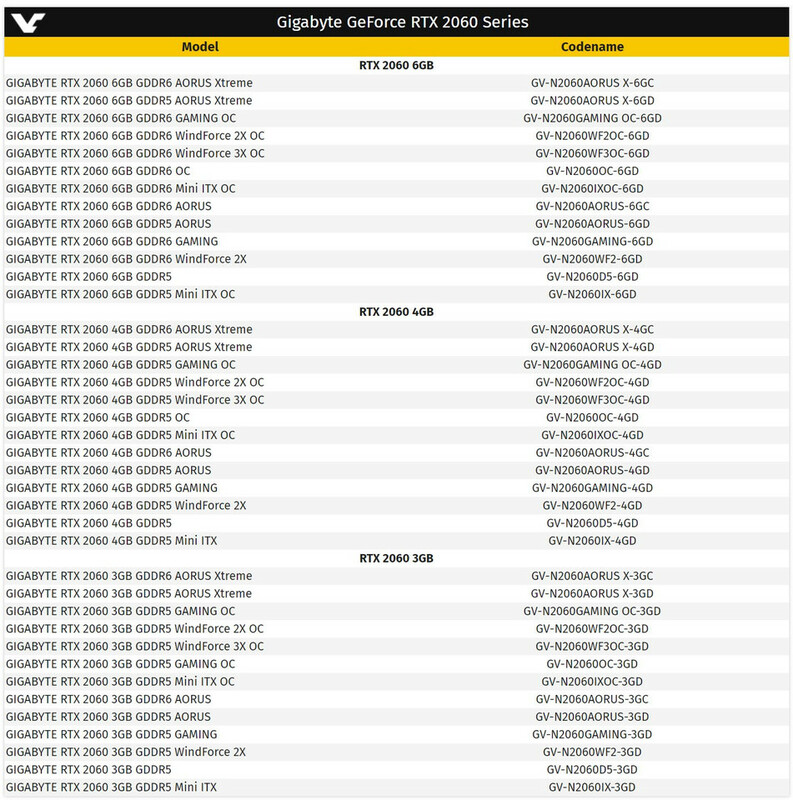 When you add up similar SKU counts from NVIDIA's other AIC partners, there could be upward of 300 RTX 2060 graphics card models to choose from. It won't surprise us if in addition to memory size and type, GPU core-configurations also vary between the six RTX 2060 variants compounding consumer confusion. The 12 nm "TU106" silicon already has "A" and "non-A" ASIC classes, so there could be as many as twelve new device IDs in all! The GeForce RTX 2060 is expected to debut in January 2019. The lather jacket idiot seems to be loosing completely his mind. By releasing 6 different cards under the same name it’s the proof that nVidia lost it. Interesting given turning on RTX in BF5 you use more VRAM. 3GB will be low SD, 4GB will be Reg SD, 6GB will be a tiny pinch of RTX. Nvidia is going intel way..
Wow thats low nvidia. I replaced my two gtx 970 for a gtx 1080 ti for one and a half year ago because i ran out of vram. And pascal gtx 1060 3 gb i dit not reccomend to people that play games al ready when it came out. And now they release a 3 gb variant again. Wtf nvidia. 3 gb ram is out in 2018 and that sure as hell aint gonna change in 2019. Unless you are a 720P gamer and how many does that in 2018/2019? Whats next. They secretly put out a card with ddr4 ram, like they dit with gt1030 and totally cripples memory bandwrith. The whole RTX launch seems something out of Bethesda/EA Games. You can get an 8 GiB RX 580 for $220. A 3 GiB card these days shouldn't be going for much more than $120 (the realm of budget cards). The way NVIDIA offering these cards makes any sense is that they have really, really, really bad yields. The fact they are going to exist strongly suggests that is the case. Even 4 GiB is rather sad. At most they should offer GDDR5 and GDDR6 variants of the 2060 6 GiB and they should call the GDDR5 variant 2060 MX to clearly indicate it's the lesser of the two. How are they going to have an RTX 2060 when the RTX 2070 is barely adequate enough to do anything RTX related? Maybe you should improve your reading skills? Yeah, 3GB is not ideal and is not enough for maximum VRAM related settings in most AAA games but IF the price is right (something around 140$ sounds right to me which is unlikely) it's not gonna be a bad value card. 0 SKU for RX 590... even after few months of launch. well done top 3 Brands(Gigabyte,Asus,Msi) for unofficially supporting GPP. Even 1060 3GB wasn't $140.... Why would a 2060 (with a larger die) be cheaper. But, April fools' is 4 months away. 2560x1440 D3D > 1920x1080 DXR on an RTX 2070. BFV manages those FPS numbers by hugely cutting down on the number of rays which translates to really no point in using them. Also, there's only a few million people that will ever play BFV on PC and only a faction of a fraction of those have an RTX card.